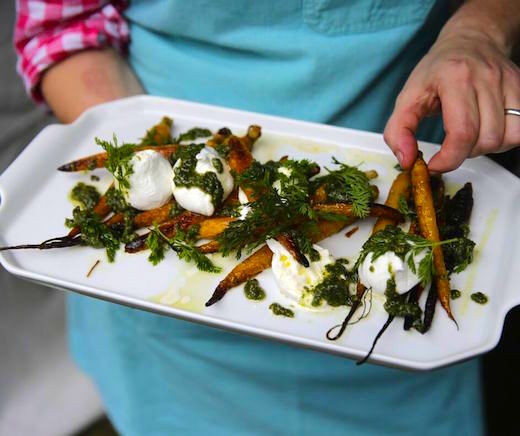 During her JBF Taste America cooking demo in New Orleans, she proved her claim by whipping up a stunning and delicious dish of roasted carrots with carrot top pesto and burrata. “Always taste your vegetables first,” cautioned Bloomfield. “If they aren’t perfect, use whatever’s in season. 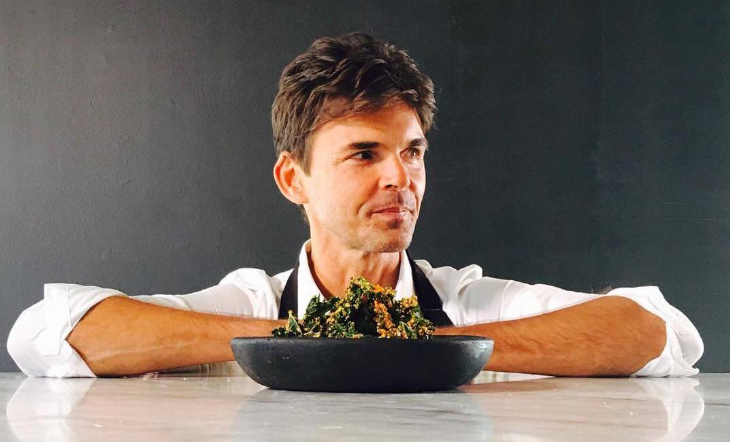 This salad would also work really well with lovely roasted beets and beet greens, or sweet fennel with fennel fronds.” Known for her nose-to-tail approach to pork, Bloomfield applies the same principles to vegetables. “I love to use the whole thing, without producing excess waste,” she explained. Cook the carrots: position a rack in the center of the oven and preheat to 500 ̊F. Trim the carrot tops, leaving about a 1/2-inch stem remaining, and reserve the trimmings, setting aside 2- to 3-inch delicate sprigs for the dressing. 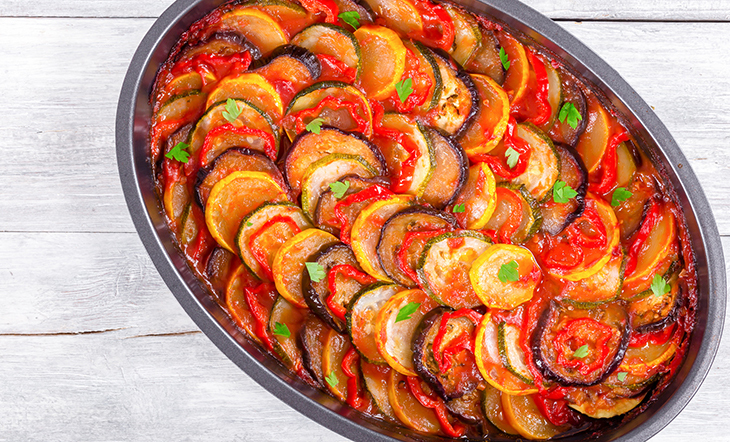 Pour 2 tablespoons of the oil into a heavy ovenproof pan big enough to hold the carrots in a single layer. Set the pan over high heat and bring the oil to a light smoke. Add the carrots, sprinkle with the salt, and turn them to coat them in the oil. Cook, turning over the carrots occasionally, until they’re browned in spots, 6 to 8 minutes. Pop the pan in the oven and roast, shaking the pan occasionally, until the carrots are evenly tender, 8 to 12 minutes, depending on the size of your carrots. Let cool slightly. Make the carrot top pesto: discard the stems from the reserved carrot tops (leaving 2- to 3-inch delicate sprigs for the dressing, about 1 1⁄2 cups, lightly packed). Roughly chop the remaining carrot tops (about 4 cups, lightly packed). Combine the carrot tops and basil in a small food processor and pulse several times. Add the walnuts, Parmiggiano-Reggiano, garlic, and salt and pulse several more times. Add the oil and then process them, stopping and scraping down the sides of the processor or stirring gently if need be, until the mixture is well combined but still a bit chunky. Taste and season with more salt, if you fancy. Make the lemon dressing: toss the remaining carrot tops (about 1 1/2 cups, lightly packed) in a bowl with the basil. Whisk together the olive oil, lemon juice, and a good pinch of salt in a small bowl until the mixture looks creamy. Use a little of the lemon dressing to lightly dress the carrot top–basil mixture, sprinkle on a little more salt, and toss well. Set the remaining dressing aside. 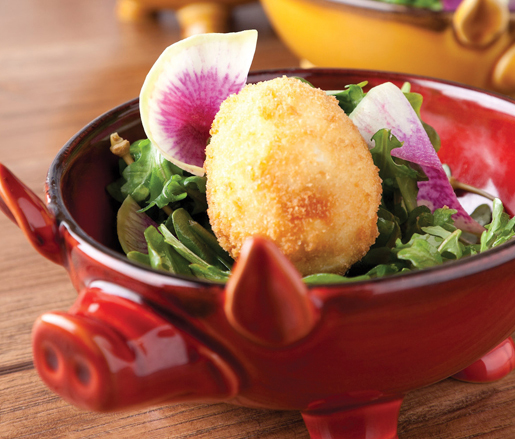 To serve, halve the burrata and arrange the halves on a platter. Arrange the carrots on the platter so they’re pointing this way and that. Add the pesto here and there in little dollops. Arrange the lemon dressing, carrot top, and basil mixture on top of the carrots and burrata. Drizzle everything with the remaining lemon dressing and serve.